This entry was written for the Oxford International Encyclopedia of Peace (OUP, 2010, vol. 3, pp. 274-77). The inherent danger posed by nuclear weapons to world peace has sometimes taken a more acute form when an actual threat to use them has been made or implied. The list of such instances now extends over half a century, from the Korean War or even earlier to the Iraq War, but there is still controversy over their extent and gravity. Sometimes the seriousness of the “nuclear threat” may be exaggerated in order to claim success (e.g. Korea, 1953).. On the other hand it may be characterised as mere “bluff”, minimising the resulting risk of nuclear war (e.g. Taiwan Straits, 1955). It has been argued that over the decades a “nuclear taboo” developed which made the actual use of such weapons unthinkable. However some participants in these events have revealed that the world came much to nuclear war than was generally admitted (e.g. Cuba, 1962). Some episodes have led to the conclusion that the threat, whether bluff or not, successfully deterred the adversary (e.g. Middle East, 1973). The record of these threats has been used by new nuclear powers from China (1963) onwards to justify the acquisition of such weapons in order to deter “nuclear blackmail.” The need to make such threats credible has also encouraged the development of more first-use and first-strike nuclear weapons by the major powers to prevent pre-emptive strikes. Finally, although the classic examples of nuclear threats belong to the height of the Cold War, the use of nuclear weapons was being threatened again after 2001 as necessary to counter alleged “rogue states” and “international terrorists”. For example. the US Doctrine for Joint Nuclear Operations, revised in 2005, states that the United States "must be prepared to use nuclear weapons if necessary" against terrorists seeking to gain use of weapons of mass destruction and against those states "that support their efforts". 1945: US-Japan (Pacific War). This threat is unique both because it led to the actual use of nuclear weapons (Hiroshima and Nagasaki) and because it was not meant to be understood at the time. In the Potsdam Declaration (26 July 1945), the US, Britain and the Soviet Union warned Japan that the alternative to surrender would be “prompt and utter destruction”. By this time President Truman was aware that the atom bomb was ready for use but had not told his Soviet ally. On the previous day Truman ordered his Secretary of War to prepare to use the bomb within the next two weeks. He noted in his diary that “we shall issue a warning statement asking the Japs to surrender and save lives. I’m sure they will not do that, but we will have given them the chance.” . 1946: US-USSR (Iranian crisis). In early 1946, rising tension over the Soviet presence in northern Iran led to strong US protests which resulted in the withdrawal of Russian troops. Although President Truman said at the time that “Russia (must be) faced with an iron fist”, there is no evidence in the archives of a nuclear ultimatum. While leading US nuclear strategist Albert Wohlstetter later described the threat as “realistic”, other analysts have argued that the ultimatum was a “myth” (Bundy, pp. 232-233). 1950-53: US-China/North Korea (Korean War). This has been described by US strategic planner Paul Nitze as “an atomic war even though no atomic weapons were used”. An early statement by Truman, after China’s intervention, that there was “active consideration” of their use caused alarm among US allies. Fears were eased as the war settled into a stalemate but the use of nuclear weapons was actively considered again in 1953 to end the deadlock in negotiations. President Eisenhower would later claim that “the threat of atomic war” had persuaded China to agree to an armistice. One careful study concludes that “however elliptical the threat conveyed to China, there is no evidence that it was a bluff” ( Betts, p.47). According to recent research “the president was much more willing to use nuclear compellant force than many have supposed” (Jackson, p.52). Though Chinese leaders claimed publicly that nuclear weapons were no more than a “paper tiger”, Beijing’s decision to build the atom bomb dates from this time..
1955 and 1958: US-China (Taiwan Straits crises). When China began bombing the Kuomintang-controlled Offshore Islands. the US considered the use of nuclear weapons among a range of options. In March 1955 Eisenhower said that there was “no reason” why such weapons should not be used “just exactly as you would use a bullet”. China moved to ease the crisis by proposing talks with the US but these proved fruitless. In summer 1958 China resumed the bombing, in part to embarrass the Soviet Union which was seeking détente with the US. Washington again seriously considered resort to nuclear weapons and shipped nuclear artillery to Taiwan: a Department of State analysis concluded that it had come “perilously close” to using them (Foreign Relations of the United States, vol. XIX, p.267). Chang believes Eisenhower “brought the country to the ‘nuclear brink’” (p.201). 1961-62: Soviet Union-US-Soviet Union (Berlin and Cuban crises). The prospect of nuclear war was raised publicly by both superpowers in the inter-related crises over Berlin and Cuba. Both originated in attempts by Soviet Premier Khrushchev to shift the cold war balance (which he perceived to be tipping in Washington’s favour), first by threatening to abrogate the post-war understanding on Berlin, and then by placing nuclear weaponry in Cuba. Khrushchev was also concerned by the recent deployment in Turkey of US Jupiter missiles, which were capable of reaching western parts of the Soviet Union. Khrushchev sought to call the US nuclear bluff, warning that a conflict would bring “untold calamities”. Determined to maintain credibility, the Kennedy administration asserted its readiness to use nuclear weapons in both crises, in spite of internal misgivings. A range of options was considered during the Berlin crisis up to and including “General Nuclear War”. Kennedy later estimated that the odds of nuclear conflict during the Cuban crisis had been “somewhere between one in three and even”. 1969: Soviet Union - China (Sino-Soviet border). Following an escalation of this dispute, with a major clash on Chenbao Island in March initiated by China, the Soviet Union began to hint openly that it might use nuclear weapons. Communist parties in the West were warned of a possible attack on China’s nuclear facilities. The US was also sounded out but responded negatively. China agreed to negotiations, but the Soviet threat triggered a mass civil defence programme and probably speeded up development of China’s nuclear arsenal. 1969: US-Vietnam (Vietnam war). In October 1969, President Nixon ordered a worldwide US nuclear alert, hoping this would pressurise the Soviet Union to induce North Vietnam to accept a compromise settlement. Signals had already been sent to Hanoi warning that Nixon would “take measures of great consequence and force.” Nixon’s move, which reflected his “madman theory” that an adversary might fear the worse from an apparently irrational enemy, was a bluff, although there had been discussion in Washington of a limited nuclear strike in North Vietnam. 1973: US - Soviet Union (Yom Kippur war). In October 1973, when Israel continued fighting in Sinai and ignored a UN ceasefire, Soviet President Brezhnev proposed a joint US-Soviet peace-keeping force and warned that otherwise he would consider unilateral intervention. The White House responded by imposing a worldwide alert (known as DefCon3), telling the Soviet Union that unilateral action would produce “incalculable consequences”. Moscow did not go ahead, and US policy-makers believed that the implied threat of nuclear war -- even if only a bluff had paid off. 1980: US - Soviet Union (Invasion of Afghanistan). The Carter Doctrine announced by President Carter warned that any further expansion by the Soviet Union into the Gulf area, and particularly Iran, would be met “by any means necessary, including military force.” The nuclear threat, though not explicit, was raised in official and media commentaries. A year later President Reagan claimed that the Soviet Union had been deterred by the risk of World War III. This episode also contributed to the belief that the nuclear threat could be an effective diplomatic weapon. 1990-1: US/Israel - Iraq ( Gulf War). Following Iraq’s invasion of Kuwait, the Israeli Prime Minister Yitzak Shamir warned that Iraq would be “harmed in a most serious way” if it attacked Israel. Airforce Commander Avihu Ben-Nun warned Iraq to “think about” the consequences of a “nuclear counter-response”. Ben-Nun later concluded that Saddam Hussein had been deterred from using chemical weapons against Israel because he “feared our retaliatory response”. 2001-3 US/Britain -- Iraq (Weapons of Mass Destruction): US strategic planning in the run-up to the Iraq war, envisaging the possible use of nuclear weapons against Iraq, was leaked to the media. The Pentagon’s “Nuclear Posture Review” concluded after 9/11 called for plans to attack WMD facilities. 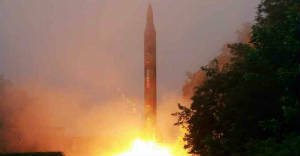 The 1995 “Doctrine for Joint Nuclear Operations” had already envisaged nuclear targeting against so-called “rogue states” such as Iran, Iraq, Libya and North Korea. The British 1998 “Strategic Defence Review” had also concluded that Britain’s nuclear arsenal should be based on the need “to deter any threat to our vital interests.” Defence Secretary Geoff Hoon now warned that states like Iraq “can be absolutely confident that in the right conditions we would be willing to use our nuclear weapons” (20 March 2002). In conclusion, we may note that the actual or potential acquisition of nuclear weapons by "new" nuclear states is generally seen as a threat by existing nuclear states, who nevertheless claim that their own nuclear weapons are a legitimate form of deterrence. Betts, Richard K., Nuclear Blackmail and Nuclear Balance. Washington DC, 1987. Blechman, Barry M. & Hart, Douglas M., “The Political Utility of Nuclear Weapons: The 1973 Middle East Crisis.” In Nuclear Diplomacy and Crisis Management, edited by Sean M Lynn-Jones et al., pp. 323-347. Cambridge, Mass., 1990. Bundy, McGeorge, Danger and Survival. New York, 1988. Chang, Gordon H., “To the Nuclear Brink”. In Blechman & Hart, pp. 200-227. Ellsberg, Daniel. “Call to Mutiny”. In Protest and Survive, edited by E.P. Thompson and Dan Smith, pp. i-xxviii. New York, 1981. Jackson, Michael Gordon, “Beyond Brinkmanship: Eisenhower, Nuclear War Fighting, and Korea, 1953-1968,” Presidential Studies Quarterly 35:1 (March 2005), pp. 52-75. Tannenwald, Nina, “Nuclear Weapons & the Vietnam War”. In the author’s The Nuclear Taboo: The United States and the Non-use of Nuclear Weapons Since 1945. Cambridge, 2007, chapter 6. US Department of State, Foreign Relations of the United States, vol. 19, Washington DC: US Government Printing Office, 2004.